Tachyon - Saving the World One Good Book at a Time: Come the Singularity there WILL be such a thing as a Free Lunch! Come the Singularity there WILL be such a thing as a Free Lunch! Who needs a freakin' body? Is the Rapture of the Nerds just around the corner? Or is the Vingean posthuman technological Singularity the biggest myth since Y2K? You know—and you can prove it in verse. Post or email (tachyon@tachyonpublications.com) us a haiku that is either pro- (it's totally gonna happen) or con- (as if!) Singularity. There will be two winners, one for each argument. Attendees at Chicon 7, the World Science Fiction Convention, will be treated to A FREE LUNCH with James Patrick Kelly and John Kessel, the esteemed editors of Digital Rapture: The Singularity Anthology. At Worldcon, the winners and the editors will meet and try to convince one another; Jim believes (sort of) and John says no way. If you win but will not be attending Chicon, you can designate a friend to defend your position (or eat your lunch). 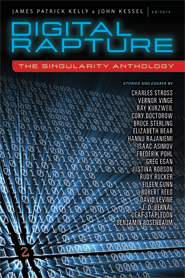 Winners and top three entrants will also receive a copy of Digital Rapture signed by the editors and several contributors and will be immortalized (until the Singularity) on Tachyon’s Facebook page. “If you believe in evolution (as well you should! ), then it follows that, one day, something might come along to replace you. Many of the early masters of science fiction thought so. Isaac Asimov was certain that we wouldn’t need to worry much before the year 30-bazillion a.d. or so. But Asimov wrote in an era before iPads and the Internet, an innocent time when mere humans still ruled the worlds of chess and Jeopardy. At the turn of the twenty-first century, Vernor Vinge warned that we might already be inventing our successor species through technological advances. That just maybe the advent of the post-humans wasn’t in the far future but was, in fact, scheduled for next Thursday. He called this (possibly) apocalyptic event the Singularity—and the future would never be the same. but it won't be post-HUMAN.